The perfect dessert for parties and luncheons, these colorful parfaits will dazzle your guests. 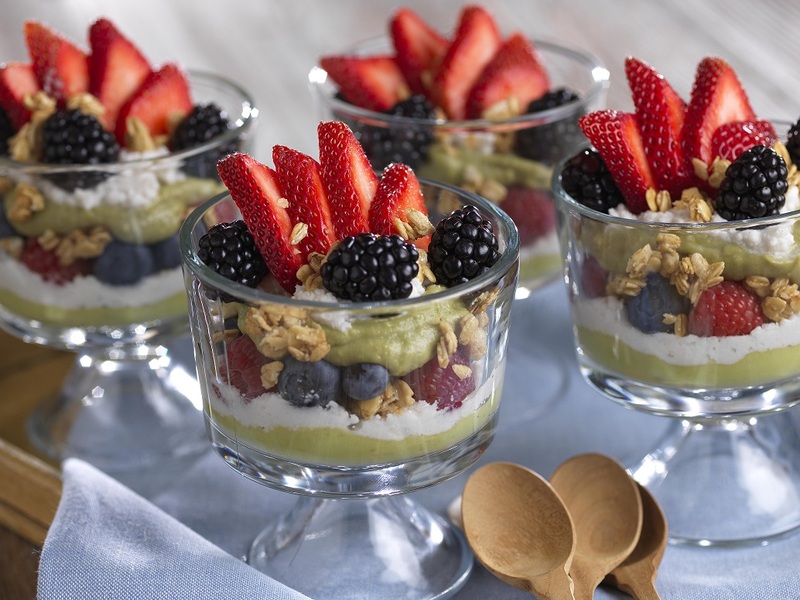 Creamy avocado-banana pudding and coconut whipped cream pair beautifully with crunchy granola and juicy fresh berries. These parfaits are best served immediately, though extra coconut whipped cream can be saved in the refrigerator. Prepare coconut whipped cream: Chill a mixing bowl and whisk attachment in the freezer for one hour. When bowl is chilled, turn can of coconut milk upside down and open. Discard separated coconut water or reserve for another use. Transfer hardened coconut cream to the chilled bowl. Add vanilla extract and powdered sugar and beat on high until peaks form (about 2 minutes). Set aside. Prepare the avocado pudding: Add avocado and banana to a blender or food processor and blend until smooth. Scrape down the sides as necessary. Assemble the parfaits: In four shallow glasses or jars, add even amounts of avocado pudding, followed by a layer of coconut whipped cream. Add equal amounts of blueberries, raspberries, and granola, followed by layers of avocado pudding and coconut whipped cream. Top each parfait with three blackberries, one sliced strawberry and a sprinkle of granola. Serve immediately.